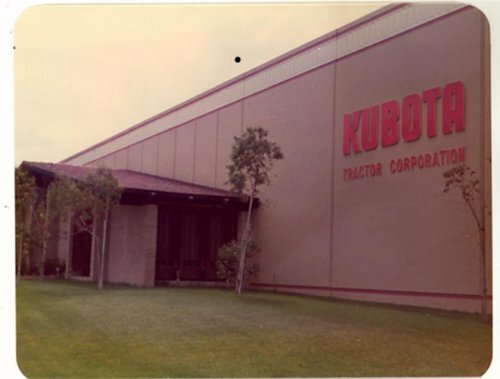 Kubota's 1972 Corporate Office in Compton California. In 1993 they would relocate to their present day offices in Torrance. 2012 is drawing to a close and before it does we should take a moment to observe Kubota USA’s 40th anniversary year. Kubota Tractor Corporation (KTC) was formed on September 28, 1972 in Compton, California with a handful of corporate employees and a few hundred dealerships to sell equipment from an initial lineup of only 4 models. 40 years later, KTC now boasts more than 1,000 dealerships and their tractor lineup alone consists of more than 75 models. What set Kubota apart from other tractor offerings at the time was its focus on compact diesel tractors, excavators and mowers which are feature rich despite their smaller size. For example, in the early 1970s the 12 horsepower B6000 was introduced with 4WD, a feature usually reserved for full sized farm machinery. Throughout the following decades Kubota continued to lead and innovate – introducing hydrostatic (HST) transmissions, compact tractor-loader-backhoes, zero-turn mowers and creating the sub-compact tractor segment (BX series) all the while continuing to meet or exceed the emissions standards for diesel engines in the US. If you are so inclined, take a look at the complete Kubota Tractor Corporation timeline. As part of their 40th anniversary year, KTC has a contest running which ends in just a few days – December 31st. Grand prize is a new L3800 with frontend loader (a $30,000 value) with first and second prizes of $5,000 and $2,500 toward the purchase of Kubota equipment. Contest is restricted to just those in the US (sorry Canada) and the first 10,000 entries will receive a limited edition Kubota 40th anniversary hat. Get over to Kubota’s Facebook page and get your entry in! From myself and Mr. K, we salute all of the dealers, mechanics, engineers, technicians, partsmen, service managers, sales managers, warehouse pickers and packers, corporate goons suits and marketers who all contribute to making sure that the highest quality, most dependable and sought after tractors always come in orange. Kubota is near and dear to our hearts. Keep up the good work ladies and gentlemen and our sincerest congrats to your first 40 years!